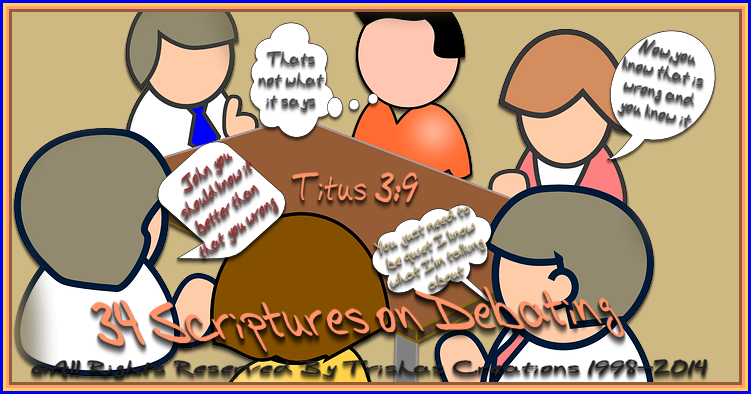 Welcome to "34 Scriptures on Debating"
This will be a touchy subject for most, as there are so many people even preachers and teachers and those who are to know what the bible says.... should know "IT'S A SIN TO HAVE DEBATES." Yep, it sure is. I've known this for a long time. I see people on Facebook allot going back and forth about something, about this person or that subject, that preacher etc. What you need to be aware of.......allot of people think you are silly!!! Debating , does not accomplish a thing... all it does is cause frustrations and anger and not to mention making the people look like they have no sense of value for the debate and sin. Debating, only causes strife between you and other's, and God sure isn't pleased with ya! We are to carry ourselves like Jesus did, we are to be open and honest about the Bible and Him and what we should do and act, but we are NOT to cause Debates about it. It's just down right silly and childish really. It's like fighting over a toy or a stuffed teddy bear, come on, it's time to grow up and stop pushing people away from God and Bring them in....that's our job, it's not Debating because someone fails to actually take heed in what someone says or shows proof of. The best thing to do, is just stay out of it!!!! Plain and simple, short to the point! I have listed several verses on the Debating subject and I hope and pray that they shed some light on the subject and you will warn other's that it is a sin and all they are doing is stooping down to the other person's level. Also, not to mention they are sinning, they need to be showing the scriptures in the Bible on Debating, maybe they can see for themselves "Uh hey Uh did you know that by debating this subject, we are sinning, I think uh we need to quit, uh ya think?" Titus 3:9 KJV But avoid foolish questions, and genealogies, and contentions, and strivings about the law; for they are unprofitable and vain. 10 A man that is an heretick after the first and second admonition reject; 11 Knowing that he that is such is subverted, and sinneth, being condemned of himself. 6 But godliness with contentment is great gain. 7 For we brought nothing into this world, and it is certain we can carry nothing out. 8 And having food and raiment let us be therewith content. 9 But they that will be rich fall into temptation and a snare, and into many foolish and hurtful lusts, which drown men in destruction and perdition. 10 For the love of money is the root of all evil: which while some coveted after, they have erred from the faith, and pierced themselves through with many sorrows. John 7:12 Among the mass of the people there was much muttered debate about Him. Some said, "He is a good man." Others said, "Not so: he is imposing on the people." John 6:52 This led to an angry debate among the Jews. "How can this man," they argued, "give us his flesh to eat?" Proverbs 13:10 A vain man through pride causeth debate, And with the counselled 'is' wisdom. Proverbs 17:19 Whoso is loving transgression is loving debate, Whoso is making high his entrance is seeking destruction. You then, my child, be strengthened by the grace that is in Christ Jesus, and what you have heard from me in the presence of many witnesses entrust to faithful men who will be able to teach others also. Share in suffering as a good soldier of Christ Jesus. No soldier gets entangled in civilian pursuits, since his aim is to please the one who enlisted him. An athlete is not crowned unless he competes according to the rules.